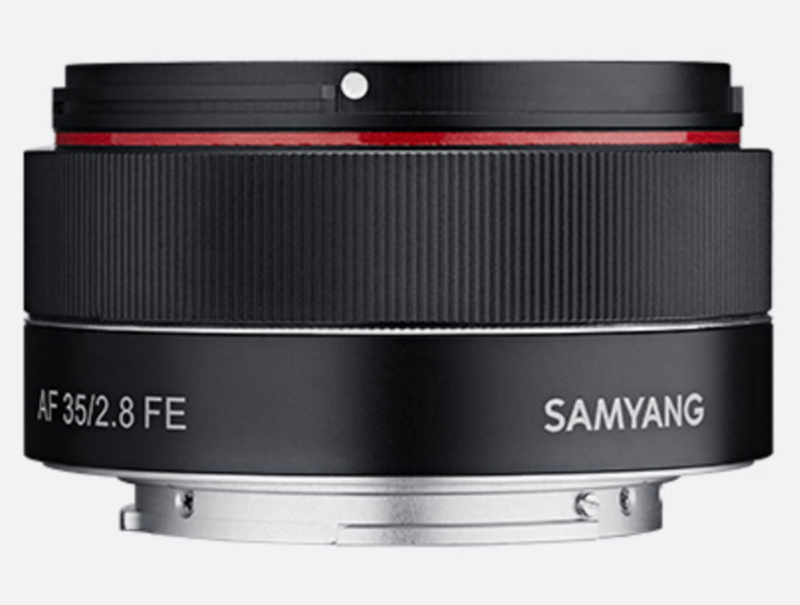 Ultraportable meets ultra-affordable in the just announced AF 35mm F2.8 FE from Samyang. Weighing a mere 85 grams—Samyang calls the lens “tiny but mighty”—the compact and lightweight full-frame prime will be priced at 299 EUR, which currently is about $336 US. 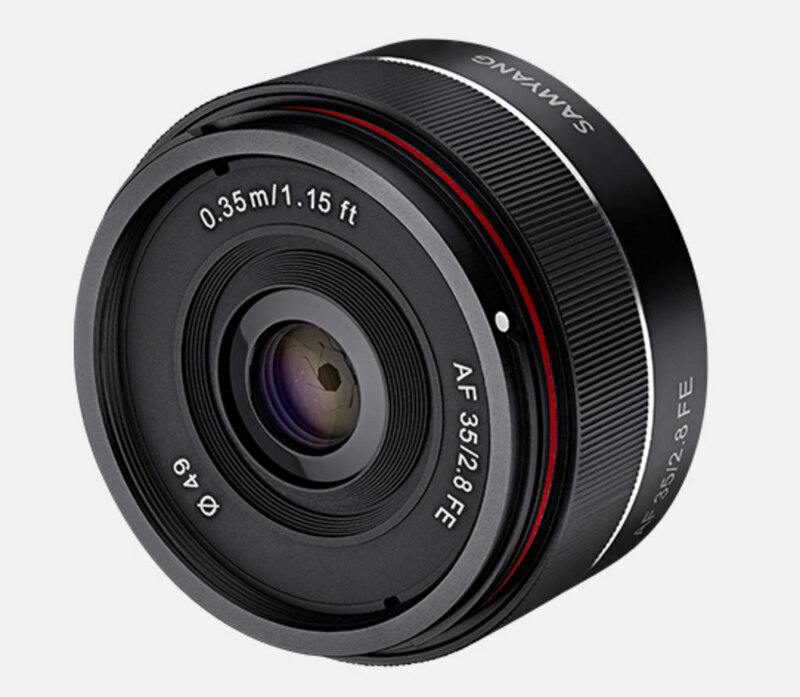 The AF 35mm F2.8 FE is the third lens in Samyang’s autofocus lineup, joining the AF 14mm F2.8 FE and AF 50mm F1.4 FE. Specifically designed for Sony E mount, the 35mm lens’ portability makes it a good choice for “everyday” photography, especially as a travel lens for portrait and landscape work. The 35mm F2.8 has an F2.8-F22 aperture range, with a minimum focusing distance of 1.14 feet. Optical construction consists of 7 elements in 6 groups, with two aspherical lenses and a single high refractive lens, plus a circular 7-blade aperture. Weather sealing is missing, but the lens has Samyang’s Ultra Muti Coating. The Samyang AF 35mm F2.8 FE is scheduled for July 2017 availability. June 5th, 2017, Seoul, Korea – Global optics brand, Samyang Optics is pleased to announce the release of Samyang’s third autofocus lens: AF 35mm F2.8 FE. A tiny lens with a mighty performance, it is ideal for daily photography as well as travel photography. This new compact and lightweight lens, together with the existing AF 14mm F2.8 FE and AF 50mm F1.4 FE lenses, now expands Samyang’s autofocus lens line-up to three. Portability with mighty performance and a 35mm focal length makes this lens the best choice for daily photographers who want to capture every memory as a high quality image. The autofocus is fast and accurate and is ideal for the capture of outdoor events such as hiking, sports events and landscape photography. It also has a minimum focusing distance of 0.3m and is ideal for street, portrait and close focus photography. This tiny but mighty Samyang AF 35mm F2.8 FE lens will be available globally from July, and will carry a suggested retail price is EUR 299. To celebrate launching, Samyang Optics will hold various consumer events on Facebook (http://www.facebook.com/samyanglensglobal) and Instagram (http://www.instagram.com/samyanglensglobal). For more information on product, visit Samyang Optics official website (http://www.samyanglensglobal.com).